Skandia UK has used a live event at Celtic Manor, near Newport, to communicate its strategies to support financial advisers. 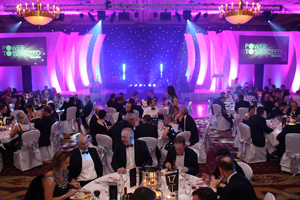 Skandia UK's 2010 annual sales conference attracted 180 delegates and comprised a day of interactive presentations followed by a gala dinner and awards ceremony, hosted by comedian John Culshaw. The main focus of the conference, entitled ‘Power to Succeed', was communicating Skandia UK's ambition and strategies to support financial advisers. Agency Line Up managed the event, which featured performances from Culshaw and a live band, as well as activities including Wii, table football and pool. Line Up producer Kath Wallace said: "When it comes to producing an event for the financial services sector in this economic climate, setting the right tone is crucial. Events like this play a vital role in internal motivation and team building, but you have to get the right balance between information and relaxation to make the experience work."